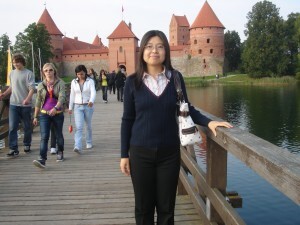 I spent a hectic week (September 13-17) at Vilnius, Lithuania for the 5th Internet Governance Forum. Although the local food is not very impressive to me, I got sufficient food for thought. On Day One, I rushed to two sessions to give presentations. One was “Setting the Scene” in the Main Room. I’m the author on Chapter Diversity for “official” IGF book “Creating Opportunities for All.” Another was the workshop organized by Council of Europe on Framework of General Principles of Internet Governance, which is a very ambitious project that may have to be handled at UN forum. On Day Two, I presented at a workshop “Internet Governance and Youth”, along with a critic lady from Pirate Party and a couple of young people. Frankly I don’t believe young people need to be arrogant to the “old” for establishment their own identity. Okay that session was not interesting. In the afternoon, I was the remote moderator for the workshop “Development Agenda.” An irresponsible commentator complained that he could not tweet the session but he lied for he did not even login the webex platform. At night, Prof. Drake and I went to UNESCO reception for a drink. Day Three was comparatively relaxing to me. I went to the Dynamic Coalition’s workshop at the beginning and SSIG workshop before lunch. In the afternoon, I went to Russian IGF session and Intermediary Liability workshop before joining NomCom outreach. At night, around seven scholars were invited to join UNESCO dinner for a strategic talk. Everyone was so busy with talking or taking notes that we did not remember what we ate. Last Day began with a Chinese workshop on open access to scientific data and library information. I later joined APrIGF report session. After having lunch with CNNIC friend, I went to city TLD workshop and had interesting dialogue on the large panel. The closing ceremony seemed endless. Prof. Ang, Mr. Tan and I ran into to heavy rain to catch the bus to go to the city for dinner. On departure Day, Mr. Tan and I went to KGB museum and felt extremely depressed by the execution photos and other old files. Later we felt better in an open market in front of the City Hall. That’s my week by Baltic Sea and my second stay in the beautiful city. Nice to go home anyway. Incredible submit which has got me considering about the potential of this concept. Definitely truly awesome. This has truly sparked up an idea in my mind. This can be a wonderful web site publish. Nice piece of info that you’ve got in this website article. Hope I can get some far more of this stuff on your website. I’ll arrive back. This has genuinely sparked up an thought in my thoughts. This really is a great weblog submit. the written content on this publish is really one particular of the most beneficial substance that I’ve actually arrive throughout. I really like your publish, I will arrive again to examine for new posts. The content on this submit is really 1 of the very best material that I’ve ever are available across. I love your publish, I’ll arrive back to verify for new posts. Good piece of info that you’ve obtained on this weblog submit. Hope I might get some additional of the stuff in your web site. I will arrive again. I am easily thankful to you for providing us with this invaluable ideas. My spouse and I are in truth grateful, really the important info we needed. This kind of is 1 of the nicest post on the blog which I have browse through till date on this particular niche. Very detailed nevertheless to the point not including virtually any fluff. Maintain up the excellent work mate. This weblog article shows how well you comprehend and know this subject. Hello there. I am very happy I found this web site, I truly discovered you by mistake, whilst I’d been searching Yahoo for another thing, Anyway I am here now and would just like to many thanks for the wonderful weblog posting as well as a all round useful web web-site (I additionally like the theme/design). I have bookmarked it and also subscribed to the RSS feeds. This is this kind of a wonderful useful resource that you’re providing and also you give it away free of charge. I adore seeing web websites that comprehend the value of providing a quality resource for free. It?s the old what goes around arrives around routine. This is such a good useful resource that you’re providing and you give it away for free. I like visiting internet websites which comprehend the benefit of providing a good resource for cost-free. Hey there, are you currently managing a custom made wp idea or could it be a totally free 1 at wp.org? You completed certain fine points there. I did a search on the subject matter and found mainly persons will consent with your blog. This really is this kind of a fantastic resource that you are providing and you give it away free of charge. I love seeing web websites that understand the value of offering a top quality useful resource free of charge. It?s the outdated what goes around comes about program. Your are great. And so is your site! Overwhelming content. Good job guys! Fascinating article, adding it to my favourites! This is a great weblog post with thanks for sharing this educational information.. I’ll visit your web site frequently for some newest publish. Spot on with this article, I truly think this web site needs more attention. I’ll probably be again to read much more, thanks for that info. nice post. Will Keep reading. With all the doggone snow we have had recently I am stuck inside , fortunately there is the internet, thanks for giving me something to do. recall, since I was here were a few. Well perfectly. I need something like this something I am working on, and mine has a similar theme as this post. I am relieved that I found it, have a good one. I was basically wondering if you ever considered switching the design of your blog? It is well written; I love what youve got to state. But maybe you can include a little more in the way of written content so people might connect with it better. Youve got an awful lot of text for only having one or two graphics. Maybe you could space it out better? Very good post. I have really enjoyed visiting your site posts. In any case I’ll be subscribing to your feed and i also hope you write again soon! Thanks, I’ll make an attempt to come back often. Happy new year! Can I publish your publish to my wordpress weblog? I will add a back-link to your forum. That’s one really nice post. My sis told me about your website and the way great it is. She’s right, I’m really impressed with the writing and slick design. It seems to me you’re just scratching the surface when it comes to what you may accomplish, but you’re off to an amazing begin! Oh man. This site is sick! How can I make it look this good ! This blog has got lots of very helpful info on it! Cheers for sharing it with me. I tried to obtain the feed for the RSS for this web-site & for some odd reason it isn’t displaying in Google Chrome. Does anyone have any ideas??? First of all thank you a great deal for your useful and helpful detail. I’ve just been searching for some information and facts about the development and all the things what is associated with it and accidentally I’ve noticed this your entry. Well, this web-site is honestly wonderful and full of many and attractive ideas about the whole lot. Thank you a good deal one additional time for the super and informative write-up and maintain up publishing these very good posts inside the future too. Hmmm for some cause only 50% of the post can be found. I tried reloading but yet the identical. Can you email me with any hints on how you made your website look this good, I’d be thankful! i believe you have a nice page here… today was my initial time coming here.. i just happened to find it doing a google search. anyway, fantastic post.. i’ll be bookmarking this page for certain. After I start your Rss feed it seems to be a ton of nonsense, is the issue on my part?